Hello again, and welcome back to Channel Chaser! Last week I talked about how so many TV shows out there right now seem to be tied to visions of the apocalypse, or the end of the world. So for my review today, I felt it was only fitting that I address one of my favorite shows, and one that I strongly believe had a role in starting this trend in the first place: the SyFy Channel’s Battlestar Galactica. To make a very long and complicated story short, Battlestar Galactica (or just BSG if you like) tells the story of the humanity as it is driven from twelve colony worlds in deep space and hunted down by the Cylons, a race of sentient robots who have rebelled against their human creators. Aside from full-frontal tactics, the Cylons have also managed to create sleeper agents that mimic human form and infiltrated colonial society, leading to the total destruction of all but 50,000 human survivors. Forming a rag-tag fleet around the last surviving military vessel, the antiquated Battlestar-class warship Galactica, the humans head out into the universe to find a new home: a fabled lost colony called Earth. It’s interesting to note that BSG is not an original product. In fact, the series that began in 2005 is actually a reimagining of a 1978 sci-fi series created by legendary TV writer Glen Larson. 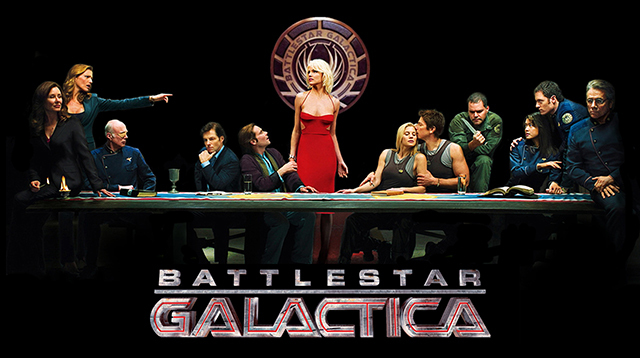 While the idea behind BSG was one of the most ambitious space operas ever conceived at the time, Larson’s show suffered from cheesy special effects due to budget problems and claims that it ripped off other genre classics like Star Wars. In the end, the ’78 series was mostly forgotten until Ronald D. Moore and David Eick rebooted it with a miniseries in 2003, followed by a four-season run from 2005 to 2009. The modern BSG differs greatly from its predecessor, the biggest change being in its shift to a much darker and grittier drama series–some describe it as a soap opera that only happens to take place in space. It features a large ensemble cast, with several main characters disappearing and then re-introduced across the seasons, or just dying during the story’s progression. BSG began with no truly seasoned or big-time acting talent, with the exception of veterans Edward James Olmos as William Adama, the grizzled commander of Galactica, and Mary McDonnell as colonial president Laura Roslin. Most of the other actors in the show, such as Katee Sackhoff, Michael Hogan, James Callis, Tricia Helfer, and many more, had never done anything of note previously, but their standout performances during BSG’s run more or less launched their careers in television. Nowadays, you’d be hard-pressed to watch any TV show where you didn’t see at least one BSG alum in an episode or two. If you ask a lot of TV fans and critics, many of them consider BSG to hold the prestigious title of “the best sci-fi show of all time,” and for good reason. This was a show that finally made science fiction “cool” for a lot of people who normally would be turned off by strange-looking aliens, goofy costumes, and techno-babble. It was a show that had enough futuristic elements to be fun and interesting to watch, but not so much that it detracted from the primary focus: the characters. And what characters they were. While the original ’78 series had a distinct lack of feminine personalities, many of the characters were re-written from men to women for the 2003 makeover to give the cast more diversity. The most fascinating thing about them, though, is that BSG managed to move beyond the traditional stereotypes and roles that abound in contemporary television and make the characters actual living, breathing people that you couldn’t help but care about. I just can’t stress enough how real these people were to me while I watched the show. Don’t get me wrong, the characters themselves were all very different in personality – from the hotheaded, insubordinate pilot Kara “Starbuck” Thrace, to the cunning and yet cowardly genius Gaius Baltar and the straight-laced but deeply troubled Lee “Apollo” Adama – but the one thing they all had in common was that they had very authentic flaws, and were completely unpredictable. The one thing that wrecks a show quicker than anything else is when you start to be able to predict how certain characters would react to given situations. That was the beauty of BSG: you never knew for sure what anyone on that screen would do, and that gave the characters a human quality and believability that is very, very hard to come by. Another fascinating element of the show was how the Cylons–the ostensibly cold “villains” of the piece–were shown to be just as human as the actual humans. A dominating philosophical question throughout the show is that of just how human the Cylons have managed to become; they take human form, bear human weaknesses, and suffer from human emotions and frustrations, and yet they are still treated like animals by the supposed heroes. So who are the real villains here? If BSG has one flaw, it is that it attempted to get a bit too heady and philosophical for its own good. This caused the story to sag at certain points, but overall the show expertly blended interpersonal drama with just the right amount of action, adventure, and awesome space battles to create something that never failed to surprise and amaze viewers. Aside from some sluggish storytelling in the first half of the fourth and final season, Battlestar Galactica is a work of television art that truly deserves its title as the best sci-fi show ever. The fact that so many other shows have attempted to follow in its footsteps only serves to prove that it has, and will be, a trend-setting series for a long time to come.